Today we invited my brother and his family over for a barbecue. My husband smoked a brisket through the night for today. I made some baked beans and picked up some of the Old Fashioned pre-made potato salad at Wal-Mart. We had brisket sandwiches that were oh so good! I have plenty more for tomorrow! I new I had a can of cherry pie filling in the cabinet. I had it to make a cheesecake but we had already used the cream cheese for bagels or something. So while I was picking up my tater salad I grabbed some Pillsbury ready made pie crust. Whipped this pie together and had it in the oven baking while the husband was slicing up the brisket by the time everyone was finished eating I was pulling the pie out of my convection oven. We had plenty of time for our dinner to digest while the pie cooled. Just before everyone was thinking about going home we had a slice of warm but not hot, cherry pie. Yum! What a vacation! First stop was Pomme De Terre Lake State Park, MO on our way to our final destination. We attended a Pop Up camper rally that we have been going to every year for the past 3 years. This year the rally was held at Mark Twain Lake the Ray Behrens Recreation area. We owned the whole loop! It was the most humid of all the rallies we have attended, not to mention the deer flies were larger than nickle sized in some cases and hovered in mid flight only to dive bomb you with numerous bites. I think the heat was more bearable than the flies! We toured the boyhood home of Mark Twain, took a Riverboat ride on the Mississippi River, cooled off on a tour of the Mark Twain Cave, squeezed in some Antique shopping and photographed many historical buildings in the town of Hannibal. MO. While camping at the lake we were asked by complete strangers if we would be witnesses for their marriage that was to take place in a Gazebo behind our campsite. We agreed and my husband and I officially became a part of the wedding party. We also celebrated 5 birthdays and a 35th wedding Anniversary during the rally! What an experience we will never forget! I decided to play with some of my camping rally pics from our trip to Mark Twain Lake - Ray Behren's recreation area. 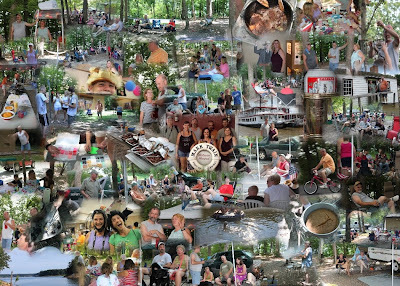 Here's the collage I came up with from our excursions to the Mark Twain Boyhood home, Mark Twain Riverboat, the Mark Twain Cave to our fine dining at the rally potlucks, outdoor games, and activities! We are back from our 2 week vacation to Taylor Park, CO! What a great vacation we had. We camped in states we hadn't camped in before. We started our journey out of Oklahoma to south of Amarillo. We stayed in Palo Duro Canyon State Park, Texas! I was a bit taken back upon arrival when I had called a week before our arrival to confirm my reservation and double check how much I would owe on arrival. I was told I would owe $22 the reservation fee, but when I arrived and was asked how many children I brought and their ages I was given another daily fee of $5 per child for bringing my teen aged children, plus another 5$ a day a piece for my husband and I. We stayed here 2 nights! I was not happy to say the least, I am glad I didn't decide to let my kids bring friends! We had a deer come into our campsite while my husband was playing a washers game with our son. The deer thought he was throwing it food. This deer was starving, I have never seen a deer so skinny. I thought state parks feed the wildlife, apparently not at the Palo Duro Canyon. I understand not wanting to feed them but in my opinion it also helps maintain some wildlife in the park if it is regulated by the park. Beats them dying of starvation. We did see some pretty plump Wild Turkeys however. Our 2nd stop was Sugarite Canyon State Park, NM! We were now in black bear country! How exciting! Or is it? We were a bit nervous, didn't much care for trying to keep anything with a scent out of the camper. We didn't remove everything we should have, but we were lucky we never seen a bear in our campground. Lake Alice Campground was known for frequent bear visits in the past. The Mesa's and Volcanic mountains were beautiful! I never seen anything like it! Our Destination! Taylor Park, CO! All I can say is Heavenly! Just beautiful! We caught so much trout & ate it that I was getting tired of eating trout! That's about the time we sent my husband off with our new camping friend Kim and they together went with a fishing guide into the catch & release areas of fishing like true fly fisherman & fisher women. :) The remainder of our stay we filled with ATV riding through the mountains, camping rally activities and potlucks! We cannot wait to camp with all of them again next year! The downfall for Colorado Dream Ranch RV park where we stayed was the fact that we were slammed with another daily fee of $7 a day for having our children stay with us. We camped here a little over a week, but the campgrounds made up for it by supplying us with unlimited firewood, & free homemade ice cream!! Mmmmmm! Our first stop for the trip home we camped in Trinidad Lake State Park. We were given an extra $5 a day charge to place the ticket in your vehicle window. Which they call a park pass. We had a great view of a mesa over the town of Trinidad, CO. This was a great place to relax for our trip home. Trinidad is such a nice historic town. I could have taken photographs all day of the buildings here. We decided to drive straight to Oklahoma from Trinidad, CO. Our final camping spot was in Boiling Springs State Park, OK! Unfortunately, they were renovating the area that accesses the springs. I took some pictures of the campground. The stickers were unbearable I could not take my Pomeranian's 2 feet out of the gravel or they would have so many stickers in their fur. We were just a few hours from home and decided to cut out a day short of what we paid for. The family was tired and not resting well so we were home bound! Now we are home and planning our next camping trip. We will be camping a week in Missouri!